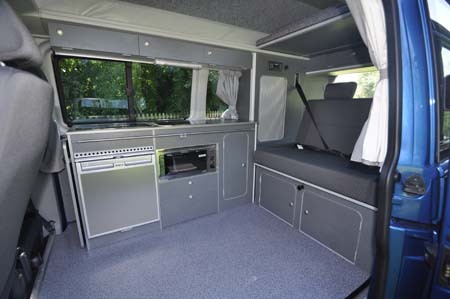 If you think the “standard” Bilbo’s Celex campervan is good, take a look at this. It’s the long-wheelbase version, less than half a metre longer than the start model, but actually opening up almost a world of extra space inside. The gains here include: additional kitchen lockers and worktop, more floor space, and a longer elevating roof. Drive one, however, and you’d be hard-pressed to tell any difference between it and its short-wheelbase siblings. Even when it comes to parking there doesn’t seem to be any disadvantage, although popular options such as reversing sensors always help. 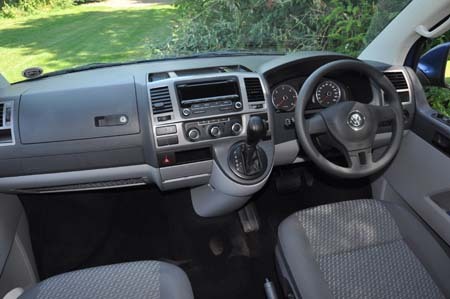 In reality, almost every Bilbo’s Celex is different, but that’s thanks to a huge range of options on both the base vehicle (think manual or automatic, different engine ratings, all manner of cab and exterior extras) as well as the conversion (elevating or high-top roofs, hard and soft furnishings, all manner of kit). Don’t dismiss any of this. A key part of the attraction here is, budget allowing, you really can make sure you specify your Celex to your needs. It all starts with Volkswagen’s superb base vehicle. Remember, Bilbo’s is one of just a handful of specialist converters that’s “authorised” by Volkswagen here in the UK and therefore qualifies for the SE version of the VW T5 (that’s not to be confused with Bilbo’s own range of budget-priced SE models, that use the standard T5 window van in 84bhp engine trim). 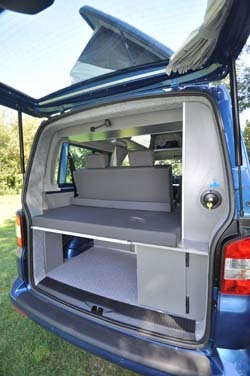 It’s all just that bit more tailored and refined for campervan conversion. If you want the latest in bling, you’re probably looking in the wrong place. Bilbo’s happily explains why it offers fitting such as thick, lined curtains rather than blinds, no spark ignition for the hob, and is sticking with its own tried-and-trusted interior lighting rather than following the latest trend for LEDs. All this could change, of course, but you have the reassurance here that, if it does, you’ll know it’s because it’s been thoroughly tried “out in the field. Indeed, “tried and tested” is very much the overriding theme here. Bilbo’s uses its own elevating roof and rear seat designs, the latter with safety-tested credentials as well as the added practicality that it knows its role as a bed, too. 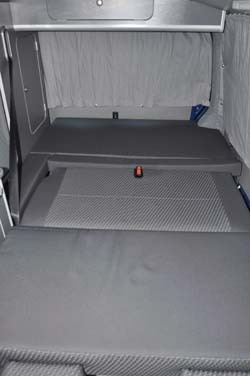 A bigger bed than most, at some 6ft 3in x 4ft 4in (at its maximum) and a locking, fold-over design that makes it so easy to convert from seating to sleeping. You can also see exactly where the Celex has evolved. There’s a grill as standard (UK customer demands). And it’s a compressor fridge with a larger than most 65-litre capacity. As well as fittings that include moulded plastic panelling, where plenty of others suffice with stuck-on carpet. But it’s also the storage where the Celex excels… the lockers over the kitchen, the drawers in the kitchen unit itself, the space under the rear seat (one locker will take a portable toilet; the other has a sliding door that makes items like folding chairs feasible to stow). 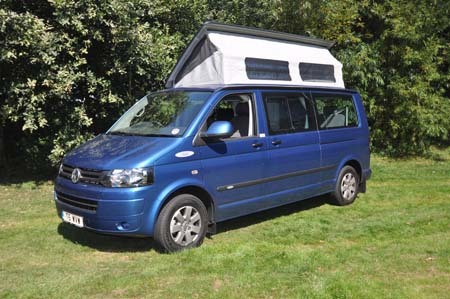 There are lots of Volkswagen T5-based campers out there. 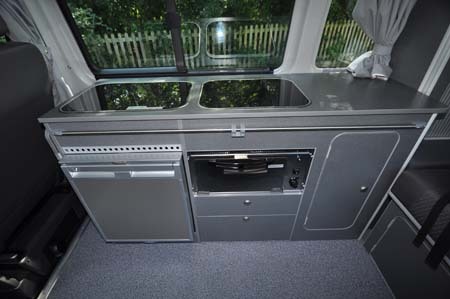 Not many have the credentials of the Bilbo’s Celex – that includes full European Whole Vehicle Type Approval, and built to NCC (National Caravan Council) standards as far as the UK is concerned – plenty are far more glitzy. Ultimately, though, few come as close for sheer practicality and quality, with a bit of extra seasoning, a la Bilbo’s style. Minus: Authorised VW conversions aren’t cheap! 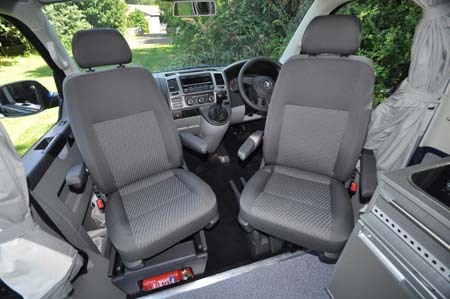 There’s more information on the Volkswagen T5 ranges on the Bilbo’s website and to find out more about our discounted premiums visit the campervan insurance discounts page. *Motorhome insurance cost based on 2014 Bilbo’s Celex retailing at £40,454 with standard fit equipment, manufacturers immobiliser and Caravan Guard approved Cat 1 Alarm. UK travel only. Kept on driveway at home at TD9 8ED. Motorhome owners – professionals over 50 years old with no claims, convictions or health conditions in last 3 years. 4 years no claims bonus mirrored from car policy and 2 years motorhome driving experience. Members of motorhome club doing less than 5000 miles annually. £300 excess applies. Premiums include insurance premium tax at 6% and are correct at 23/09/13. 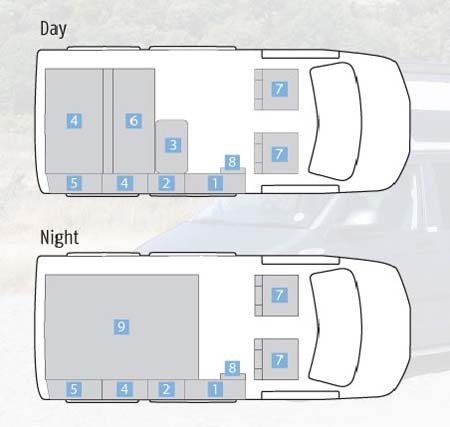 **Price is ex-works, on-the-road, and includes VAT @ 20% but excludes a recommended retailer delivery charge of £545 including VAT which includes delivery and preparing your caravan for collection by you.